For most musicians, time is not on our side. We have to hustle with a day job, work tons of gigs, teach, or do a combination of things. That is why flute practice is so important. But, if you don’t have much time, you need to focus on quality over quantity. In music school, the idea that I had to practice for hours a day was drilled into my head. If I wanted to be the best, I had to practice as much as I could. Now that I am out of school, that is just not possible for me. I work full time in an field outside of music, and so I don’t have multiple hours a day to dedicate to practicing. I wish I did, but I don’t. Since graduating, I have learned to appreciate the time I do have to practice. Here is why quality practice is so important and how you can make the most of the time you have. One thing I have started doing lately is getting up a little earlier than normal. I set my alarm for thirty minutes before I *need* to get up, and I use those 30 minutes to practice. I did this in school, so why can’t I do it when I’m out of school? There are many benefits to practicing first thing. The obvious benefit is that you get it out of the way. You don’t have to think about it all day. That’s especially nice if you work all day. Another perk of practicing first thing is that I have the energy to do so. I know some people are super groggy first thing, but I am lucky that I am not. Since I am awake, I am able to use some of that energy to practice. If I were to wait until I got home from work, I would be tired, and I would not have the motivation to practice. It can be a mental list. I like to make a list of what I want to accomplish in any one practice session. Maybe my goal is as small as improving my harmonics. It might be as big as perfecting a section of a concerto. A list can help streamline your practice and help you focus on what you need to work on. If you just pick up your flute without any goals or direction, you will just be wasting that time. So make a list of a few small, achievable goals that you can work on for your next practice session. Another great thing about listing out your goals is that you can look back at them. You can look back to see if you accomplished your goal or if you missed something. Then you can reevaluate for your next practice session. If you are not genuinely motivated to practice, you will not get anything done. I have found that unmotivated practice is a huge waste of time and energy. It accomplishes nothing. While it can be tempting to practice whenever you have the time, it’s not always worth it. If your mind is elsewhere, put the flute down and come back later. Mindless practice is exactly that: mindless. Walk away. Go watch a show. Read a book. Take a nap. Do whatever it is that is taking your attention away from the flute. Part of practice is being able to discipline yourself, and that includes knowing when to take a break. You will improve, but not if you are practicing without wanting to. When you have limited resources, you learn to make the most of what you do have. That includes time. Unless you are in music school (not working), or you somehow managed to find a full time performing job, you will not have endless practice time. You will have an outside job, or other classes, or other life responsibilities that you need to tackle. That, sadly, leaves less time for music. But part of becoming a well rounded adult is learning to make the most of what is available to you. If you really prefer to practice for a longer period of time, utilize your days off. Get up earlier. Go to bed later. Do what you need to do to practice how you need to, but remember that time is limited. So make the most of it. As I stated above, I like to get up about 30 minutes earlier than I need to so that I can get clock in a half hour of well rested, motivated practice time. I start with harmonics and then long tone to warm up my lips. Then I move to some technical exercises so that I can work my fingers and practice different articulations. After that, I play through Debussy’s Syrinx from memory. That helps me maintain the piece from memory, and I can practice my expressiveness. Finally, I move into solo and ensemble music. Since I play in a flute choir, I usually like to work on the harder sections or pieces. I also like to work on a solo or two to build my repertoire list. If I have the motivation later in the day, I practice some more, and I will usually pick up my piccolo. However, since I have already achieved thirty minutes of uninterrupted practice, I don’t feel bad if I don’t have the motivation to play later in the day. That’s the nice thing about having an outside job. I can be more forgiving with myself when it comes to music. I don’t *have* to practice all the time. Music is something I can do on my own terms. How do you practice? Do you practice quality over quantity? Let me know in the comments! There are tons of resources for younger music students, but there aren’t many books or websites that target older learners. I started playing flute at age 16, and many of the basic beginner tools and books were for elementary school students. So, I want to share some flute tips for older beginners. I have played music of some sort since I was 6, but flute came later. 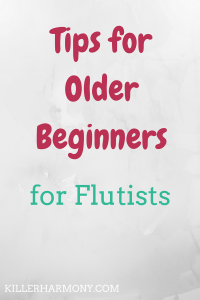 Whether you have prior music experience or not, I hope these tips help you up your flute game. One of the biggest assets that older beginners have is their drive. Many young students play music because of their parents or friends. When you’re older, you can focus on music and do it for you. Whether you are 16 or 60 and up, these tips are for you. The Rubank books are a great beginner method for flute. Most “band books” are created with younger players in a class in mind. Those books aren’t well suited for older beginners or students who are learning independently. Rubank has four volumes across three levels for flute players. The beginner method is similar to other beginner books, but it goes a little bit faster. In my experience, older music students are more motivated to improve. Older beginners can handle the speed at which Rubank moves along. It is easier to learn and progress on an individual basis rather than in a class. If you start with a good quality method book, you will be better prepared for the future. Get a Good Student Flute. 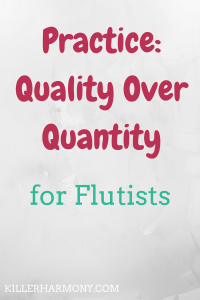 By good student flute, I don’t mean those cheap no-brand flutes you find on Amazon or Ebay. As an older beginner, especially if you are financially independent, you can afford a better instrument. While brands like Jupiter and Gemeinhardt are well known, they are not always the best quality. I would recommend brands such as Trevor James, DiZhao, and Yamaha for older beginners. Those instruments will last longer than other brands, and they will hold their value better. Trevor James, DiZhao, and Yamaha are more expensive, but they are worth it. I have the Trevor James 10x, which plays just as well as my more advanced flute. I have also heard good things about the DiZhao and Yamaha student flutes. Tone is the foundation of your flute sound. When you are starting out and as you get better, make getting a good tone your priority. That is another reason why you want a good flute. I always start with tone exercises when I warm up. Harmonics, long tones, and octave leaps are all essential to my practice routine. If you are a full time student or you work full time, you probably have a limited amount of practice time. Tone exercises are a quick and easy way to build and maintain your sound on flute. Since you cannot practice all the time, listen to flute recordings on your way to work. Have some music playing while you make dinner. Listen, listen, listen. You can then try and emulate the sounds you hear on those recordings. Listening to music also helps you learn new pieces. As you reach the point of learning full repertoire, your ears can be a super valuable resource. I don’t listen to recordings as much as I should, but they are extremely helpful when I do listen. I am a part of a few different flute related Facebook groups. I love being able to both ask and answer questions about the flute in a safe space. Everyone in those groups has a different background, and we can all share our experiences to help others. When you first begin the flute, you won’t be able to answer questions. 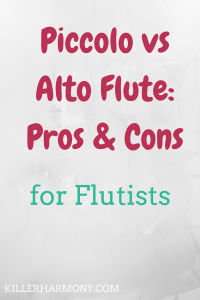 You can ask all the questions you need, and there are many flutists who can help you out. Flute groups are especially helpful if you cannot take private lessons. Members include everyone from beginners to professionals, flute teachers, and flute technicians. If you take any advice from this post, let it be this. Do not give up on the flute. It can be difficult. You might have days where you don’t want to practice. You might have a bad tone day. Things happen. If you really want to play flute, you have to work on it. Giving up is the easy option, but is it worth it? Music does wonders for the mind, body, and soul. We need more adult amateurs in this world. Music should not just be something for children. Music is for everyone. If you do have a ton of doubt about playing flute, take a break. Step away from it for awhile. Give yourself a break. That might be all you need. You might go back to the flute and have a renewed love of the instrument. When did you start learning the flute? Are you an older beginner? Or a re-beginner? Let me know in the comments! With Halloween being over and the holidays coming up soon, I thought it would be fun to write a post about gift ideas for musicians. Whether you are a musician or you know a musician, this post is for you. If you aren’t a musician, but you know one, it can be hard to think if gift ideas. If you are a musician, hopefully this post can give you some inspiration for your own wish list. 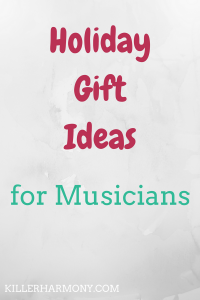 Gift giving is one of the best things about this time of year, and I want to share my ideas for gifts that every musician needs. So without further ado, here are my top gift ideas for musicians. And not the teeny tiny wire stands. As a musician starts to progress and work on more and more music, they need a better music stand. Those folding wire stands can barely hold anything before they collapse. You don’t need the most expensive stand out there, but you need one that is durable and can hold your music. I have and love this Gearlux music stand. It is super durable, but it is also easy to take with me to rehearsals or performances. The top part is vented, with holes, that make it a little lighter, but still a great stand. So if you have an advancing musician in your life, a new music stand is a great gift! This is different from a music stand, because it holds an instrument, rather than music. There are stands for almost any musical instrument. Almost any musician, beginner or professional, can benefit from an instrument stand. Putting your flute, violin, or saxophone on a stand keeps it safe when you’re not playing it. Setting your instrument on a table or chair is not safe. You never know if it could get knocked off or roll onto the ground. Some one could sit on it. It’s just not a good idea. An instrument stand saves you from that issue. Good quality stands are built to keep your instrument on them and secure in their place. My favorite brand for instrument stands is Hercules. They are made super well and don’t cost an arm and a leg. When writing on sheet music, you never want to use pen. The music might be a rental, or you may want to change something later. That is why pencils are the way to go. But pencils can get lost or left behind at rehearsals. So an abundance of pencils is necessary. You could get the simple wood ones or some cute ones with music notes on them. Another great tool to go with pencils is a pencil guard or holder for a music stand. These things keep pencils out of the way of your music, but still close by for when you need them. This one is a great way to keep your pencils secure, right by your side. Another great pencil holder that can also hold other accessories is this one. Notation paper is perfect for budding composers, aspiring teachers, and anyone else who wants to write their own music. Notation paper is also great for music majors, because they often have assignments that require blank notation paper. There are a few different styles, but I really like this Hal Leonard one. It can fit in a binder, which is great for students, and it is also not too bulky. While there are countless music notation programs, there is something about putting pencil to paper. You aren’t bound to the limitations of a particular program, and you can write anywhere. No need to have room for a laptop or tablet. Most instruments come with good cases already, but it can be fun to give someone a cuter or more stylish case or bag. For flutists as well as clarinet and oboe players, Fluterscooter is a great brand. I do not have any of their bags yet, but I think they are so cool and pretty. They are more expensive than other brands, so you want to be careful before giving these bags as a gift, but they are worth it. I think the black patent leather bag is so chic and professional, and it puts any other case cover to shame. Another great brand for cases and bags is Protec. They make cases and case covers for almost every instrument. I have their flute case cover, and it has lasted over four years now. They are insulated, and they come with an awesome shoulder strap to make carrying your instrument easier. If you’re a musician, what’s on your wishlist this year? If you know a musician, do you think you’ll get them any of these items? Let me know in the comments below!